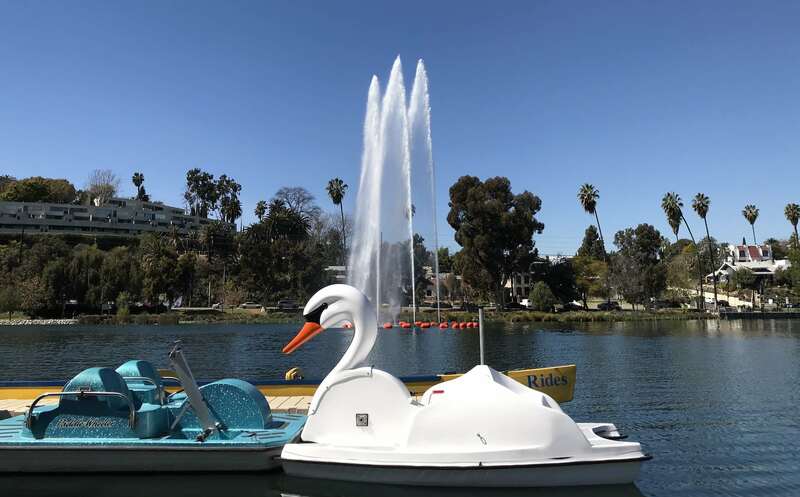 New swan pedal boat at Echo Park Lake. 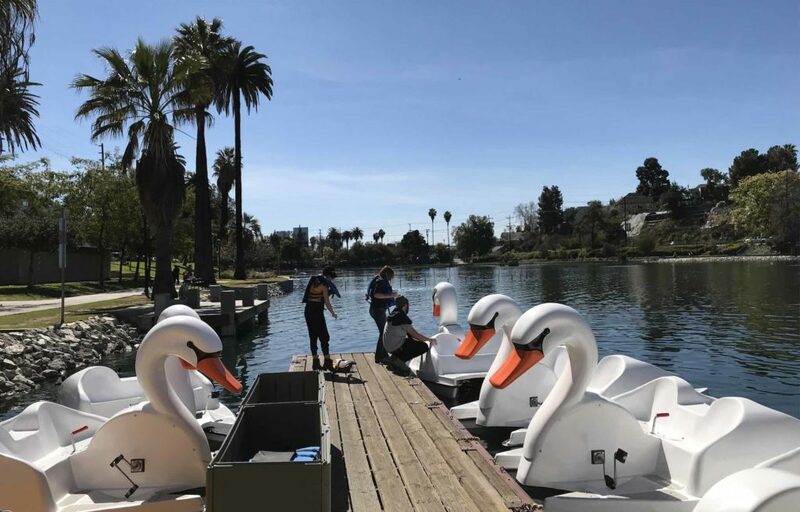 Photo by Brian Champlin / We Like L.A.
Swans have arrived at Echo Park Lake just in time for spring. Well, sort of. The pedal boat services at the lake are under new management, and part of the change includes an upgraded fleet of swan-shaped pedal boats available for rental. 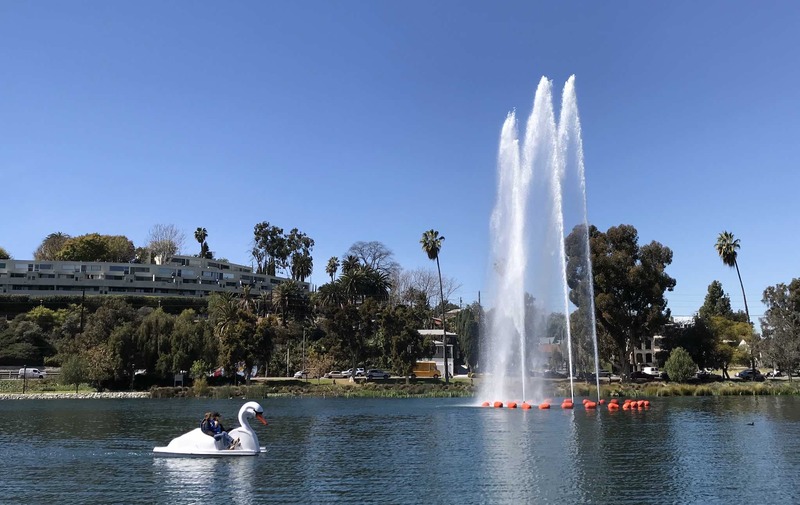 Wheel Fun Rentals has taken over the pedal boat rental space previously run by Chaffin & Reeves (doing business as Echo Park Lake Pedal Boats Canoe & Gondola). The first day of new service was this past Saturday, and it included the debut of the aforementioned swans. According to The Eastsider the previous operators were outbid by Wheel Fun for the rights to manage the rentals in a decision approved by the Department of Recreation and Parks this past September. Chaffin & Reeves had provided pedal boat rental services at the lake since the extensive renovation of the area that took place in 2013. Riders are prepped for a swan boat ride. Photo by Brian Champlin / We Like L.A.
We Like L.A. spoke to assistant manager Tom Oddo, who was has worked at the pedal boat rental space for the past 10 months, and was kept on during the transition of service providers. Oddo said the newer boats represent a significant upgrade, both in terms of size and the notable addition of canopies to shade pedal-boat riders on the open water. A small swan boat can accommodate two adults and two children under 10 years old. A large swan boat can hold up to five people. Presently about half the fleet has been swapped out for the new swan models, but the plan is to convert all of the boats in the near future. Rentals cost $11 per hour for adults and $6 per hour for children (ages 2-17). This is a $1 increase for both adults and children compared to the old rates. Weekdays are your best bet if you want to guarantee rental availability, as weekends tend to sell out quickly. Once summer begins Oddo told We Like L.A. he expects to see high demand every day of the week. A swan pedal boat glides across the lake. Photo by Brian Champlin / We Like L.A.
Boat rentals are available year-round, seven days a week from 9 a.m. to sunset. The boathouse is located on the eastern side of Echo Park Lake, adjacent to Beacon at 751 Echo Park Ave, Los Angeles, CA 90026.